Using toasted American oak casks, this is an easy-drinking Talisker that takes the distillery's classically rugged character and softens it, while maintaining the smoky and sweet notes the distillery is known for. A well-rounded flavour profile is packed with fresh citrus, sweet smoke, peppery spice and maritime notes. Talisker Single Malt Scotch Whisky is from the oldest distillery on the Isle of Skye. The San Francisco World Spirits Competition 2017 - Double Gold Medal. Well-balanced and approachable, with a lively interplay between sweetness, smoke & spice. Best served in a Talisker Rocks Glass, neat or with a little water. Matured in refill and toasted American oak casks, with a slightly higher proportion of toasted casks. A perfect gift for those looking to explore island single malt whiskies, known for their general smoky style.Produced at the oldest distillery on the Isle of Skye, Talisker Single Malt Scotch Whisky has been made by the sea since 1830, with its smell and taste instantly connecting you to its rugged maritime home. Every sip is a taste of the Isle of Skye itself, one of the most remote, windswept yet beautiful landscapes in Scotland. Talisker Skye pays tribute to the rich varied landscape of Isle Of Skye - from soft, serene shores to the dark, jagged peaks of the Cuillin mountains. 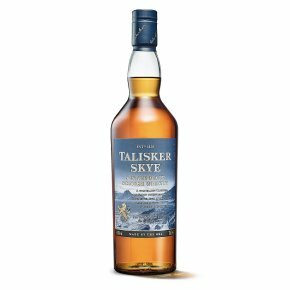 Introduced in 2015, Talisker Skye brings with it a well-rounded and sweet flavour profile packed with fresh citrus, sweet smoke, peppery spice and traditional Talisker maritime notes. It's matured in a combination of refill and toasted American oak casks, with a slightly higher proportion of toasted casks. Talisker Skye takes the distillery's classically rugged character and softens it out, while maintaining the smoky and sweet notes the distillery is known for. Best served neat or with a little water. More approachable, but undeniably Talisker, it's the ideal gift for those looking to explore the smoky world of Single Malts.